The Glasgow Operations Centre (GOC), is the biggest integration of systems within the Technology Strategy Board (UK Government’s innovation agency) Future Cities project, in Glasgow. This involved the integration of Public Space CCTV, Urban Traffic Management and the Cities Civil Contingencies. The GOC went operationally live in 2014, in time to support the management of the Glasgow 2014 Commonwealth Games and provide comprehensive security surveillance for the city, three years on; Glasgow’s City Council operated system is paying back its return on investment, assisting the council and police to effectively manage everyday situations across the city. 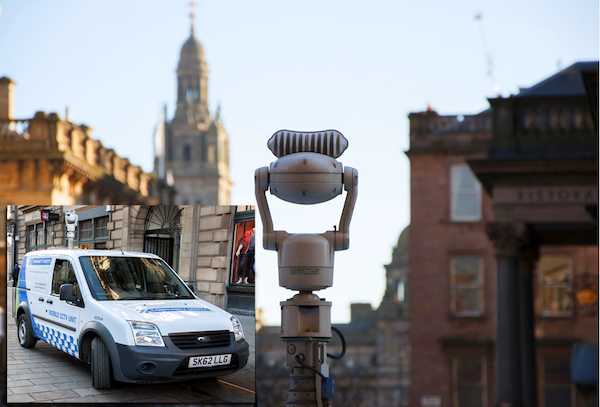 “The initial contact with Glasgow City Council first came from a chance demonstration of 360 Vision Technology cameras at the IFSEC 2013 exhibition. After being impressed by the company’s ruggedized HD Predator’s performance and functionality, 360 Vision was invited to talk more to Glasgow about their camera project requirements and objectives. The Glasgow scheme was awarded Central Government funding in 2013. Fulfilling the all-essential role of camera imaging, 360 Vision Technology supplied over 500 HD Predator all-in-one PTZ cameras. The cameras were installed in and around the city centre, with over 65 being deployed for Traffic Monitoring, and fitted to Community Safety vehicles. Some cameras were also supplied with 360 Vision’s built-in LED white light option, to enable control room operators to be proactive when dealing with certain incidents. Apart from providing lighting to achieve high-quality video images in dark areas, the use of white light acts as a visible assurance or as a deterrent to subjects under nearby camera surveillance, to make it clear that live surveillance monitoring is being carried out. At the time of specification, the HD Predator camera was the only ruggedized camera of its type in existence. Other innovative features, such as the camera’s distortion free flat glass viewing window and associated wiper, and the fact that all 360 Vision cameras integrate easily to a wide range of 3rd party control and recording technology, all played a part in securing the camera’s long-term viability as the city’s camera of choice. Today, the camera is proving its longevity of performance and ROI within the Glasgow public space scheme.